Call now for assistance to repair your shower or a quote for the installation of a new one - 0151 438 2297. Showers break down, similar to most things. Our qualified engineers can repair your shower professionally and more importantly, correctly. We offer competitive rates and guarantee all repairs & installations for 12 months. We offer this services to all areas in Liverpool & Merseyside. We support all major brands & models and use high-quality materials. Give us a call today and speak to one of our engineers about our shower repair service. 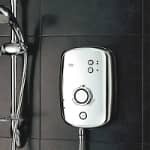 Note: Through our years of experience, we have determined that it is often more economical to replace cheaper electrical showers rather than attempt repairs. Of course, this is on a case by case basis. We will always attempt to offer you the best solution and the most economical to repair your shower. Our NICEIC certified electrician will attend if required for the shower repair/installation. We can repair your shower to coincide with your schedule. Up-front and fixed pricing structure. Certified Personnel will attend your shower repair. Q: Can you repair thermostatic showers? A: Yes. A common fault is the internal cartridge failing which can be easily replaced. Q: Can you repair electric showers? A: Our extensive experience shows that there is very rarely any economic value in attempting to repair a shower unless it is in warranty. For example, if the shower were not in warranty, it would need to be diagnosed, parts sourced, ordered and then fitted. It may include shipping the unit back to the supplier who may charge for the repair (including shipping costs). However, in most cases, it'll be cheaper to source a new shower for £70.00-£100.00 for a basic unit. Q: Can I source my own shower and arrange an appointment for it to be fitted? A: Yes. Please make sure the thermostatic shower will fit correctly or in the case of an electric shower the correct kW shower is purchased. Q: Can you source and install a new shower unit? A: Of course. In most cases this is the common route. It avoids the customer purchasing an incorrect unit regarding size, power and fitting dimensions. Q: How long would it roughly take to install? A: You would be looking at our minimum charge of first hour. However, we would need to check it would be a straight swap and no pipework needs modifying to install the new unit correctly. Q: Can you recommend a good shower brand? A: Yes. Gainsborough and Triton are generally very good quality for their price point. Q: Can I select a more expensive model from a suppliers for you to source? A: Yes. If the shower is very expensive this will need to be paid before the shower is sourced. Contact us to discuss this.